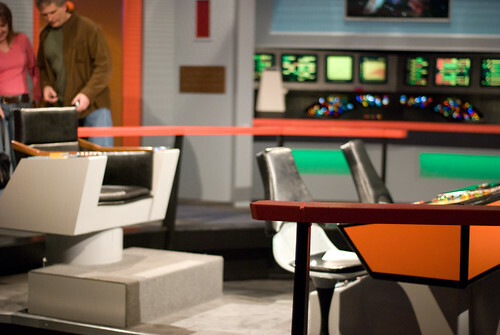 There are many places bloggers can find inspiration for their next post, but none so intriguing as in the adventures of the crew of the starship Enterprise. Boldly go where none have gone before. Don't be afraid to tackle new ideas, ones that, in some cases, aren't being touched, even by other bloggers. There's a huge benefit in being first to a topic that will build your brand and your audience. Seek out new life and new civilizations. Blogging isn't just about finding a niche, it's about building community. If you do it right, you will discover new communities and create a way for them to interact that was never possible before. Obey the Prime Directive.The highest law followed by the crew of the starship Enterprise is that they not interfere with civilizations they discover in a way that would be harmful or wrong. Take the same attitude toward your community. Let it develop on it's own and never impose your own agenda. Promote cooperation and understanding. When the crew of the Enterprise did interact with other lifeforms in the United Federation of Planets, it was always in a spirit of cooperation. And, of course, seeking greater understanding was the basic motivation for all of the crew's missions. Bloggers should do the same with each other and their audiences, always promoting mutual benefits. Use technology correctly. The crew members of the Enterprise have learned to use technology for everyone's benefit and using it for selfish ends is discouraged. Bloggers have the same opportunity to use technology to build up and empower community and to connect with others. Be sure to use the incredible power you wield responsibly. Don't forget to go to warp. Like the warp engines of the starship Enterprise, blogging and social media allow you to travel far, spreading your message and engaging with others well outside your immediate circle. Use these tools to broaden your world, to learn, and to network with others you don't yet know. Watch out for Klingons and Romulans. No matter how hard you try, there are some who won't understand you or appreciate what you have to say. Don't worry about these people. Hopefully, they'll just move along to the next blog or community and leave you and your audience in peace. Always bring your Tricorder. There are many tools you can use to learn more about the community you are creating, from Web analytics to Facebook Insights and beyond. Like the Tricoder used on Star Trek, they can tell you more about this frontier you're exploring and how to better make sense of it. Keep your transporter in good repair. Some magnetic dust once caused this device to malfunction, splitting Captain Kirk into two people. Needless to say, care must be taken to maintain the tools you use, from blogging platforms to social communities, Web hosting to personal technology. If something can go wrong, it will, so take the time to learn how to keep all your tools safe and working. When you voyage to the final frontier of blogging on the Internet (at least the final frontier until the next one comes along), don't forget the tips you've learned about what it takes to create an effective blog and online community. With these basic guidelines, you can live long and prosper in the new worlds you help to discover.